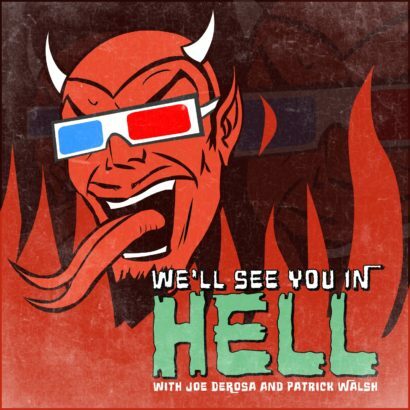 Comedian Joe DeRosa and writer Patrick Walsh discuss or provide commentary on a different horror/ sci-fi/ fantasy film each week. The guys go off on tangents aplenty, break balls, and test the limits of their friendship while riffing on classics, underrated gems, and plain old crap. Joe DeRosa is a touring stand-up comedian whose written and performed three Comedy Central specials and five comedy albums. As an actor he’s appeared recurrently on Better Call Saul, Inside Amy Schumer, and guested on several popular television shows. DeRosa made his directing debut with the short film Cheat, which premiered at the Tribeca Film Festival. Patrick Walsh is a television writer who has worked on such shows as “It’s Always Sunny in Philadelphia,” “2 Broke Girls,” and HBO’s “Crashing.” He is currently Showrunner of the Charlie Day-produced Fox comedy “The Cool Kids.” Walsh is a two-time “Drunk History” narrator, and he wrote jokes for the 2017 White House Correspondents’ Dinner.